A handpicked collection of the best, must-have, fun Star Wars gifts and collectibles, chosen from amongst thousands, for Star War fans of all ages. These are some of the most fun, cool Star Wars collectibles. May you enjoy them! May the Force be with You! 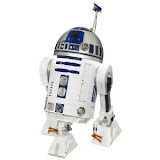 This movie-accurate R2-D2 responds to voice commands, dances and plays music, reacts to famous Star Wars characters, doubles as a beverage holder, plays multiple games, can find and follow you, and more! Its sonar navigational technology and infrared location sensors make him one the most advanced droids around. Stick him on your computer monitor! Bobba Fett - the most notorious bounty hunter in the galaxy! The cult figure - he personifies danger and mystery! This motion sensing Yoda is able to detect anything around 2m away and warns the intruders (or anyone just walking by) in one of six Yoda phrases! USB powered, simply plug and play Yoda, stands 6" tall with base, and has a lightsaber that illuminates. Designer Star Wars USB Flash Drives! Compatible with Windows and Mac, their storage capacity ranges from 4GB to 16 GB. Darth Tater, the Spud Lord of the Sith! 5.5" - 7" tall Star Wars bobble heads for your home or office! Made from durable and safe PVC plastic, with a sturdy base. All six live-action Star Wars feature films in the highest possible picture and audio presentation! Star Wars: The Complete Visual Dictionary - is the ultimate guide to the characters and creatures from the entire Star Wars saga! Star Wars: Frames - features 1,416 stills or frames, selected by George Lucas from each of the six Star Wars films, that distill the story into its visual essence.